Saying that we “celebrated” may sound inappropriate at best, even disrespectful. It’s not. It makes sense, considering how we view life, death and sacraments. 11th century Bremen isn’t 21st century Minnesota, or 31st century who-knows-where. And that’s okay. A lack of over-the-top eulogies is among the more obvious differences between Catholic funerals and America’s old-school funeral obsequies. Or “orgies,” as a con man said in Huckleberry Finn. Most Catholic funerals, that is. I was at a funeral Mass where some of the bereaved folks came up front for a few words. One of them launched into a lengthy and impassioned panegyric. She finally got winded and sat down. That was the first and last time I saw folks come up front to say their piece at a Catholic funeral. Not that I’ve been to many, Catholic or otherwise. I don’t doubt that the overly-enthusiastic eulogist was sincere, and quite possibly accurate. But impassioned and seemingly-interminable monologues like that are embarrassing, at least for me. Sharing good memories is one thing. Laying them on with a trowel is another. Maybe that’s why my father-in-law said ‘don’t let them canonize me’ to the parish priest. The priest mentioned that remark at some point, I don’t remember when. There’s a time and place for sharing memories of who our family member, friend, associate or neighbor was, and what that person did. How we share has been changing since I started paying attention. Photo displays are, to my knowledge, only a few decades old. Some now include digital media. Getting ready for these remembrances may be easier when we’re dealing with someone like my father-in-law. But it’s never, I think, easy. Folks in my household and extended family have been putting together photo montages and other memento collections: some of which have been displayed in his house. One of my brothers-in-law was showing folks around the house after the wake. I don’t have a problem with that sort of thing. Maybe because I’ve yet to experience one that’s like the “orgies” in old jokes. I don’t see a point in describing a philanthropist, font of wisdom and all-round good guy who’s pretty much the opposite of the irascible old coot being buried. Folks can be uneasy about funerals and death at almost any age. I’m well past this life’s midpoint, so my anxieties and interests aren’t quite like a child’s or youth’s. But they’re probably not that much different, either. Not when I step back and look at the big picture. I can’t reasonably expect heavenly limousine service, with or without “a fiery chariot and fiery horses.” Death? That’s something I can expect. It’s inevitable. How I see death may take a little explaining, starting with how I see faith and reason, science and religion. Noticing and appreciating this universe isn’t new. We’ve known all along that we live in a good, beautiful and vast world — and been impressed. “You adorn the year with your bounty; your paths drip with fruitful rain. “How great are your works, LORD! or the luminaries of heaven, the governors of the world, they considered gods. Lovecraft’s “The Call of Cthulhu” isn’t on a par with Thomas Paine’s “Reason” or J. B. S. Haldane’s “Fact and Faith.” But I think it echoes how folks deal with our new horizons. Some folks, that is. I might be scared of what we’re learning, if I imagined that my fate depended on Aristotle being right. Or that philosophers and scientists create or control reality: that Earth really was in the center of celestial spheres when Aristotle said it was, and stated orbiting our sun when Copernicus wrote about his theory. I have no idea whether anyone really believes that. On the other hand, a few folks insist that Earth is flat, and that’s another topic. “…It’s something too many of us forget, that reality has layers. Occasionally people ask me how I can be Catholic and a science journalist. The answer is simple: Truth does not contradict truth. Both science and religion are pursuit of truth. They’re after different aspects of truth, different layers of reality, but they’re still both fundamentally about truth. “We assume that there’s a right and a wrong way to describe the universe. … Quantum mechanics is right or it’s wrong. It isn’t right for some folks and wrong for others. Truth is truth whether we know the truth or not: Earth revolved around the sun even when people thought it was the other way around. We didn’t have all the answers when Copernican theory upset Aristotelian applecarts. We still don’t. But we’ve learned a bit more. We learned that planetary orbits aren’t perfectly circular. We discovered that Copernicus was right, to an extent. This universe isn’t centered on Earth, or our sun. Most of it isn’t even in our galaxy. I don’t mind living in a universe that’s neither geocentric nor heliocentric. I figure God is still large and in charge. This is also not a new idea. is there any limit to his saving action? I figure Pope Leo XIII and St. Augustine of Hippo are right. I’m a Catholic, so I don’t have much wiggle room when faith and science are in play. Deciding that I’ll believe the bits I like, and reject truths I don’t isn’t an option. Not if I’m going to be a Catholic. Happily, I like living in a universe that’s vast and ancient on a cosmic scale. I also like having a body. I could try believing that death doesn’t happen, that my body will keep living forever. Since I’m a Catholic, that’s almost what I expect, but not quite. I’m not sure which is more comforting, or unsettling — believing that I stop existing when I die, or that I’ll live forever. Seeing this life as all that there is could let me think I can do whatever I like, with consequences limited to what happens before I die. That could mean good times for me, with cleanup left as a chore for someone else. An anthropomorphized “All Dogs Go to Heaven” theology could have the same effect, provided I didn’t think too much about justice and all that. Predestination is another can of worms. One that I’ve talked about before. You’ll find “Predestination” in the inevitable link list after this post. Living forever will be good news or bad news, depending partly on what I’ve done with my life. But I won’t be dragged, kicking and screaming, into Heaven if I don’t want to go. I’m not sure why so many Christians, including the occasional Catholic Christian, believe that they’ve got inside information on the Final Judgement’s timetable. Folks who buy ‘End Times are Nigh’ books aren’t all like Non Sequitur’s Lucky Eddie. Some are smart, some are well-read. My guess, and it’s no more than a guess, is that many never got around to thinking hard about what they believe and why they believe it. Or don’t realize how often another ‘End Times’ prognostication flares, fizzles and fades. It’s been several months since I ran into an in-progress “rapture” prediction, so we’re probably due for another one. “Rapture,” by the way, is one of America’s contributions to world culture. Along with Mickey Mouse and Marlboro cigarettes, and that’s yet another topic. Topics. I don’t take America’s perennial ‘End Times Bible Prophecies’ seriously, apart from the effect they have on folks. And as opportunities to talk about what I do, and don’t, expect. I think the Final Judgment will happen. I don’t know when that will be. That’s fine by me. I’ve read what our Lord said, recorded in Matthew 24:36–44, 25:13; and Mark 13:32–33. Details of the Final Judgment’s timetable seem to be available on a ‘need to know’ basis. The Son of God didn’t need to know, so I sure don’t. 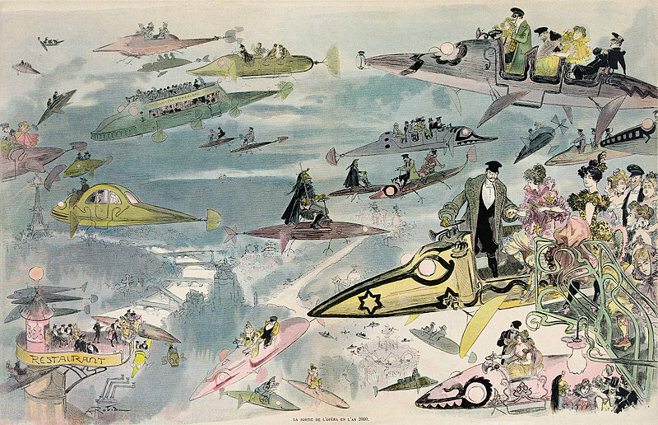 I very strongly suspect that most efforts at imagining what’s next are about as accurate as Albert Robida’s flying cars. That hasn’t kept folks from trying. Revelation 21 seems to be a favorite starting point, and that’s yet again another topic. Whatever it’s like, I expect it’ll be better than I expect. Better than I can expect. and his care is with the elect. since they neglected righteousness and forsook the LORD. “For those who despise wisdom and instruction are doomed. if it reaches a hundred years. so are these few years among the days of eternity. This entry was posted in being Catholic, discursive detours and tagged death, faith, Final Judgment, Last Judgment, last things. Bookmark the permalink. Sorry to hear about the best in the family. I’ve never been to a Catholic funeral. I’ve always heard about them. Sounds highly different than the average style of the funeral I’ve attended. Regarding the “End Times,” I’m always reminded of those books called Left Behind. Thank goodness I was never a believer in that theology. Jesus clearly stated in many parables that the wheat and weeds would grow together for the appointed time then they’ll be separated. Moreover, Jesus said “I’ll be with you till the end of the age” which indicates that he intends on coming back only once. Also, I haven’t seen it all since studying Catholicism and becoming Catholic, but the idea that we can know when Jesus will return is widespread in Protestant circles. The distortion of the major/minor prophets has led to faulty speculation and hysteria. The ones I see advocating for Jesus’ timeline are the exact people advocating for a rebuilding of the Jewish temple. About my family’s situation, thank you. We’re coping – me, too; although it’s a work in progress. About End Times and all that – – – Very strange, indeed. Or maybe not so much. 😉 I’ve noticed that at least a few folks can be counted on to get – ah, alternatively-reasonable? – ideas. On pretty much any topic. About lead-up to the Final Judgment and all that – – – my way of looking at it is by using vaguely-parallel situations in today’s cultures. Using a particular model, I see my role as someone pretty close to the base of the organizational chart. I’ve got duties, and enough authority to get my jobs done. My duties include a little planning, mostly what I’ll call tactical decisions. What I do is all low-level stuff. Strategic decisions involving everyone and everything? That’s top-level. Part of Matthew and Mark say that our Lord, God’s Son, didn’t know the Final Judgment’s timetable. I figure the information is available on a ‘need to know’ basis. If a person in the Holy Trinity doesn’t need to know: I sure don’t. I’ve got as much as I can handle as it is. Correction: “Sorry to hear about the death in the family. ” Becoming Catholic has profoundly opened my eyes to the vast contrast in eschatology by my former Reformed tradition. As I read the Church docs on the Last Things, I’m extremely more hopeful and encouraged by things such as the Final Judgement. The furthest I’ve seen the timetable extended to was a full-blown algorithm on historical events that predict the exact date . Very fancy timeline though. I will definitely read the link provided!